As I mentioned two weeks ago, February is National Hot Breakfast Month. In honor of the month honoring my favorite meal of the day, all my Souper Tuesday posts will be breakfast recipes. Last week, I was overcome by irritation and the possibility of snow, so I neglected to write a Souper Tuesday post. I’m hoping to make it up to you with today’s dish: crepes. Oh, my mouth just waters at the word. 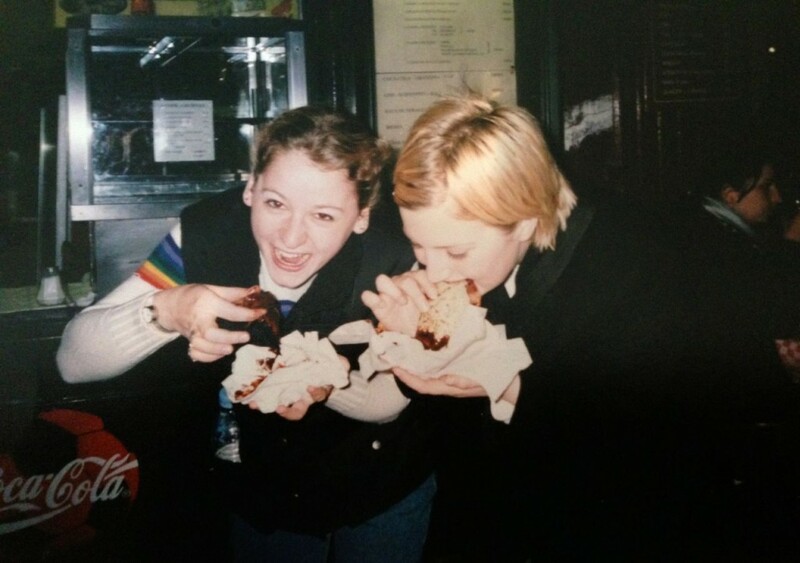 Let me start with a picture of my first encounter with crepes. The trip was everything you imagine them to be: hostel bunk beds and those curtain-less communal showers, cheap wine (and lots of it), grungy clothes, little sleep. Oh, and a backpack stuffed with CDs, a Discman, a 35 millimeter camera and lots of film which you hoped captured the important moments and didn’t accidentally get exposed before you could have it developed. The picture above definitely captured a big moment. If my eyes were open, you would see a look in them that resembles a future addict getting his or her first hit of crystal meth. One bite, and I was hooked. Did I mention this was a Nutella crepe? Crepes are something you can get fairly regularly these days – I loved La Creperie in Chicago, and I keep close tabs on the whereabouts of the Parlez-Vous Crepe truck. But they’re not as ubiquitous as a stack of pancakes or a slab of French toast, so I’m glad I can make them for myself whenever the craving strikes. The combinations of crepe fillings are endless. I suppose you could serve crepes just like pancakes, with syrup and butter, but for dinner, fillings make them a meal. I decided at the last minute to make these tonight, so I had to work with what I had. The vegetable one could have used a sauce, but other than that, they were all good. I suppose the number of crepe recipes themselves are endless; here’s the one I used out of Mark Bittman’s How to Cook Everything Vegetarian. 1) Whisk together all ingredients except the butter for cooking until smooth; you can do this in a blender. If the mixture isn’t quite pourable, add more milk. If time allows, let the batter rest in the refrigerator for an hour or up to 24 hours. 2) Put an 8- or 10-inch nonstick skillet over medium heat and wait a couple minutes; add a small pat of butter. Stir the batter and use a large spoon or ladle to pour a couple tablespoons of the batter into the skillet. (I used 1/4 cup batter per crepe.) Swirl it around so that it forms a thin layer on the bottom of the pan. 4) Stack the crepes on a plates as you make them, and keep them warm in a low oven while you make the remaining crepes. Even better, fill each crepe while it’s still in the pan, putting the filling in the bottom third of the crepe. Either roll the crepe starting at the end with the filling or fold the bottom third over the filling, fold the sides, then fold the crepe from the bottom up. Slide it onto a plate and serve. Repeat the process, adding butter to the skillet as necessary and adjusting heat as needed, until all the batter is used up. Things I should mention: First, I doubled this recipe, and the four of us ate all but one crepe, which Noah has requested in his lunch tomorrow as a “crepe sandwich.” Don’t think I am proud of this; I ate all four as a service to you, the reader, even though I was pretty full after one and a half. Don’t ask me how the kids made it through all four rounds. Noah even had a bonus plain crepe at the end. I should also mention that while I included #4 in the directions, above, this is nothing like how they were actually served at my house. The crepes came out of the pan, sometimes torn at the edges, were haphazardly filled and bundled and immediately delivered to the plate of whomever was screaming the loudest. It was like feeding time at the zoo. It was a lot of work, but it was worth it. Noah and Pat both raved about how “exciting and delicious” the meal was. They clapped at the end of it. Really. Do you love crepes as much as me? What are your favorite fillings? And can someone tell me how to put the accent on the “e”?